For the rest of the Swedish trip, we spent days walking through Sodermalm, the hipster downtown of Stockholm. With the beautiful cobblestone streets, random vegan buffets and bakeries, stunning Swedish art and shopping, and the views of Stockholm - it was our favorite place to walk. 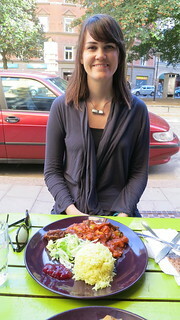 We ate at Chutney - which is absolutely amazing Indian food with the Swedish style buffet. You get unlimited chutney, Swedish bread and vegetables, coffee and tea with up to two plates of amazing food. It was so good we ate their for lunch and dinner the same day! I still miss the food to this day. They have desserts as well, which are ok but not amazing- the meals were better. We also happened to see a vegetarian buffet lunch spot while looking for a half-vegan bakery. Vegetariskt Matcafe Legume was 90% vegan and was similar to the Chutney buffet style of super healthy, good, Indian and Mediterranean food with free coffee and bread. I also heard about a bakery that had many vegan options. Naturbageriet Sattva was a complete surprise for me. I walked a long way to find it, and when I finally found it, I was kind of disappointed. It looked like a really boring natural bakery - which the name means basically - natural bakery purity (sattva = purity in sanskrit). The place was very minimal and the baked goods were in one small fridge. They looked really blah (like most Swedish desserts: flat, to the point). Since I walked the whole way there, I still loaded up on almost every vegan dessert anyway. I grabbed a cinnamon roll, cakes and cookies, everything. The lady was very nice. She was surprised we were not Swedish because she said every foreigner comes in with a massive backpack (probably all the vegan travelers on a trek from Happy Cow). She explained how an American Buddhist helped make some of the recipes. We walked out of there, packed the desserts away and didn't even try them until that night. To my surprise - they were AMAZING! They were to die for and I gobbled them up with our friend's parents. Lesson: Don't judge a dessert by it's boring exterior! I know this is VERY overdue, but we had a pretty amazing time in Sweden that included private boats, islands, Swedish vegan restaurants and bakeries, and lots and lots of blonde tall people. We flew from Paris to Sweden on September 7th after spending a very relaxing day in a suburb of Paris with Lucas' family. We took an hour flight that was almost empty with the first people who spoke English in 2 weeks! I almost spoke French to them when they greeted with with their big HALLO. We left Paris, which I was happy and sad about. After about an hour and a half, we started flying over an amazing scenery of jagged islands, deep blue water, and lots of trees. We landed in the middle of a lush forest and nothing else about 40 minutes away from Stockholm. They have a high-speed train that goes directly to the city center in 15 minutes and goes over 200 mph. We arrived at night and Kris, Lucas' college friend from Hong Kong, picked us up and drove to his house just outside Stockholm. Everything was clean, perfect, and quiet. Kris and his wife suggested we go to a popular island called Sandhalm which takes 2 hours by ferry that next day, Sunday. 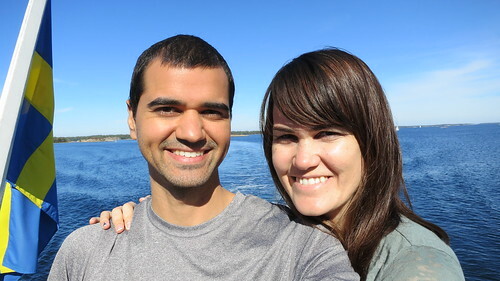 We awoke on Sunday very early and jumped on a ferry that took us to the Baltic Sea. The weather was amazing, the air is clear, and the mini islands we passed for two hours seemed to be an endless loop of perfect red and white Swedish cabins with private yachts. The Swedish flag flew in the wind and the only foreigners in Sweden sat in the back of the boat, a couple Indian guys, some sort of white lady, me, and Lucas. Everyone in Sweden kind of looks like me except 99% have bright blonde hair. We are all tall with similar features, which was interesting to see. I don't think they see an integration with darker skinned people or even brunettes so the segregation felt weird all the time - but it was still beautiful. We reached the island at lunch to find absolutely nothing to eat. Luckily Kris packed us some notoriously thick Swedish bread (quite good) and jam to survive the rest of the day on. He also gave us some notoriously STRONG Swedish coffee in the morning to keep us up the rest of the day. We roamed the island to find clear water filled with jellyfish. Beautiful cabins scattered the coast, but this island was only a 15 minute walk across. We started walking through the forest and there wasn't a person in sight. Only beautiful trees, mushrooms, and cushy plants underneath our feet. It felt like a gnome would pop out at any moment, and the silence was shocking and refreshing. We reached the other side of the island where there was a beach with the coldest water known to man. A group of crazy Swedish people jumped right in to the freezing water and stripped down naked to change in front of us - which they seem to like as well! 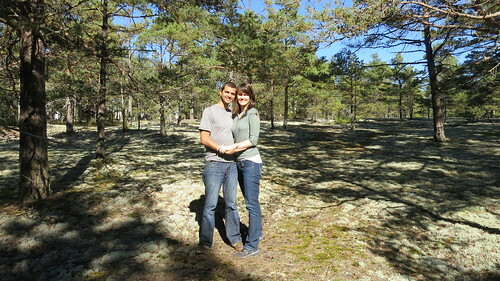 We roamed seemingly deserted island for a couple more hours and headed home on a belly full of dill chips. Every restaurant only carried meat and the only vegetarian option only opened up after the boat left. But it was still an amazing day!